Home with 5 acres, 80 acres and 115 acres (77.56 tillable acres) m/l in 3 tracts in Owen County plus Personal Property. DIRECTIONS: From IN-59 (Main Street) in Clay City, turn East onto State Highway 246, stay on 246 for 3.5 miles. The property is on the left (North) side just across the Clay/Owen County line, watch for Johnny's signs! Tract 1: This Real Estate is a 4 bedroom, 2 bath all brick home situated on 5 acres. The home has central air, electric ceiling heat, electric water heater, 100-ampere breaker box, well water and septic. The refrigerator, range and oven all stay with the home. The home has a beautiful new roof. There is a 1-car attached garage with overhead electric garage door opener and a concrete floor. The home has a circle asphalt drive, along with a 72' x 48' pole barn and a shed. Tract 2: This Real Estate is 80 acres along State Road 246 on the east side of the old County Road. There are 45.41 tillable acres m/l. Tract 3: This Real Estate is 115 acres along State Highway 246 & County Line Road/County Road 300E. 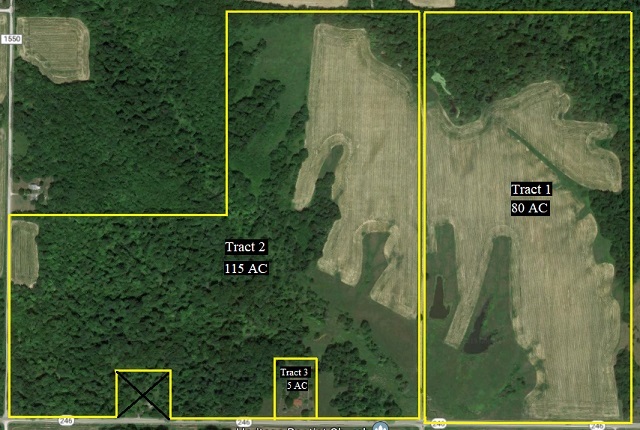 There are 32.15 tillable acres m/l. Terms: (Terms of Real Estate) The Successful Bidder will deposit 10% of the contract purchase price (minimum $1,000, except for exempt entities) at the Auction in the form of cash, cashier’s check, approved personal check or company check with bank letter of guarantee (no bank drafts). The Buyers will sign a non-contingent real estate contract with the balance due in 30 days or thereafter within 5 days of presentation of insurable title. The Real Estate will be sold “AS-IS” with no warranty, expressed or implied, but will be free and clear of any liens or encumbrances. An ALTA 2006 Title Insurance Commitment in the amount of the contract price will be supplied to the Buyers by the Seller and Seller shall pay for title search, premium for owner’s policy and cost to correct any title defects. If obtaining a loan, the Buyers shall pay the mortgage policy and recording of necessary documents. The Auction will conclude when the Auctioneer determines that all Buyers have made their best and final offers. Anyone desiring to bid must be approved prior to sale by Johnny Swalls. Any statements made by the Auctioneer on day of sale or during the sale take precedence over any oral or written heretofore. Buyers Premium: (Real Estate Buyers Premium) The Buyer's will pay 6% Buyer’s Premium which will be added to the bid price to arrive at the contract price. Possession: (Real Estate Possession) The evening of May 18th or later. Mineral Rights: Mineral Rights: An ALTA 2006 Title Insurance Commitment in the amount of the contract price will be supplied to the Buyer for the surface, if the Buyer desires a mineral search it will be at Buyers cost and will not delay the closing. Mineral Rights: All underlying minerals, coal, fireclay, gas and oil rights owned by Seller will go to the Buyer, if any and without any warranty. Survey: $900 a tract to be paid for by the Buyer.